Access physical activity grades, report cards and other related documents from all Global Matrix events in which Poland has participated. 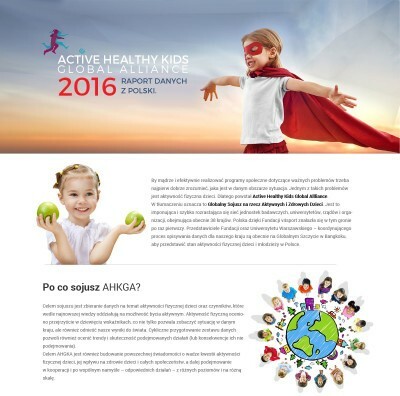 "For us in Poland, AHKGA Global Alliance 3.0 is An initiative that goes far beyond grades and identifying problems around physical inactivity of kids. Being part of the aliance creates an opportunity to spark a movement towards more active kids in Poland. A movement in which, representatives of all of the sectors are involved, as this is the only way to achieve change." 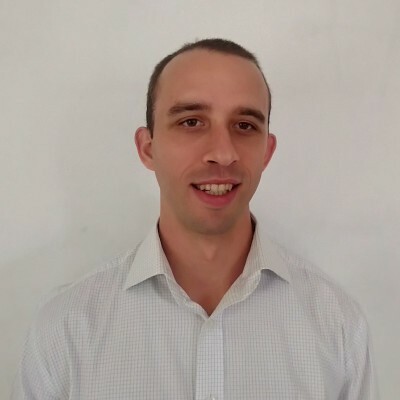 - Paweł	Zembura, Ph.D. and Agata	Korcz, Ph.D. 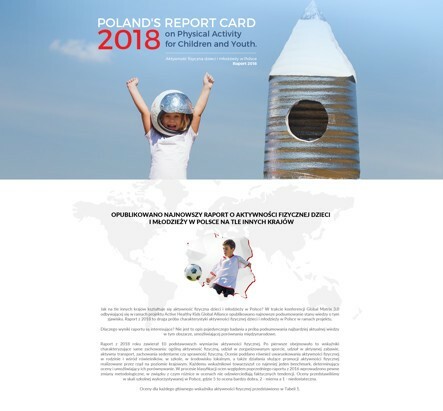 The 2018 Polish Report Card is the second assessment of children and youth PA in the Active Healthy Kids Global Alliance project, following the Global Matrix 2.0 in 2016. The 2018 Polish Report Card included 10 core PA indicators used in the Global Matrix 3.0. The Research Team (RT) conducted systematic reviews to identify data sources applicable to each of the indicators, which were later assessed based on the same set of criteria. All data sources were published within the last 5 years (since 2013) except for the ones referring to the Physical Fitness indicator. Little has changed regarding the grades and informative data sources in 2018 when compared to the Poland's Report Card in 2016. Important limitation were acknowledged - the grades were based on self-reported data and RT was not able to identify nearly any data sources regarding children younger than 10 years old. In spite of the promising environment regarding PA in Poland, as suggested by strong grades allocated to the School and Government indictors, the proportion of children and youth who meet the recommended levels of PA and screen time remains low. Promotional efforts need to extend beyond school sports in Poland and multicomponent strategies that engage family, peers and the community should be encouraged in order to maximize participation in PA for Polish children and youth. Zembura and Gołdys are with the Social Challenges Unit at Robert B. Zajonc Institute of Social Science, University of Warsaw, Poland. Korcz is with Poznan University of Physical Education, Poznan, Poland. Cieśla is with the Faculty of Medical and Health Sciences, Jan Kochanowski University, Kielce, Poland. Nałęcz is with the Institute of Mother and Child, Warsaw, Poland. Aleksandra GołdysAleksandra Gołdys is co-founder of the Social Challenge Unit at University of Warsaw, Poland. For more than ten years, she has conducted research, social interventions and advocacy with a special emphasis on public health, physical activity and innovation in education. Alexsandra cooperates with the main Polish foundations that deal with life capabilities of youth (e.g., Polish Children and Youth Foundation, Foundation for the Development of the Education System, Unit for Social Innovation and Research “Shipyard”, The Polish-American Freedom Foundation) and also with international organizations such as Stanford University, Brown University, ISCA, and UEFA. 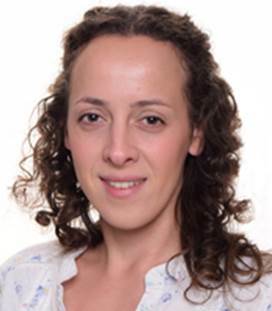 Aleksandra is most proud of being part of community-based projects like planning sport strategies for two Polish regions and from the first Polish qualitative research on social usage of governmental sport infrastructure. For the last two years, her team has evaluated four main public interventions focusing on increasing physical activity level among youth, co-financed by the Ministry of Sport and Tourism in Poland. Aleksandra believes that researchers share responsibility for translating research results into real actions and real change. Goldys A, Nałęcz H, Zembura P.
Background: The 2016 Poland’s Report Card on Physical Activity for Children and Youth is the first assessment of child and youth physical activity in Poland using the Active Healthy Kids Global Alliance grading system. The main goal was to summarize and diagnose the current state of child and youth physical activity (PA) in order to increase awareness and surveillance. 2) Methods: The systematic methodology that underpins the Active Healthy Kids Canada Report Card was adapted and applied. The best available data were consolidated, reviewed by a group of experts, and used to assign the letter grades to nine core PA indicators on a scale ranging from A (highest) to F (lowest). 3) Results: 1) Overall physical activity (D), 2) Organized sport participation (C), 3) Active play (INC), 4) Active transportation (C), 5) Sedentary behaviors (D), 6) Family and peers (C), 7) School (B), 8) Community and the built environment (C), and 9) Government strategies and investments (C). 4) Conclusions: The final grades show a strong role of school in providing PA to children and youth in Poland. However, promotion of school-based sport participation appears to be insufficient by itself to sustainably promote PA in this group.